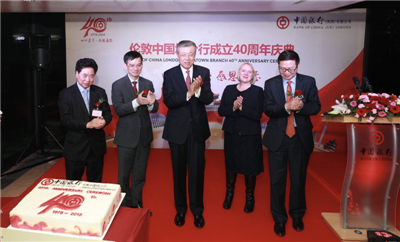 On December 10, Ambassador Liu Xiaoming attended the 40th Anniversary Ceremony of the Bank of China (UK) Limited London Chinatown Branch. Fang Wenjian, General Manager of the Bank of China London Branch, the Rt Hon. Lord Bates PC, Minister of State at the Department for International Development, Joanne McCartney, the Statutory Deputy Mayor of London, and Chu Ting Tang, President of London Chinatown Chinese Association, delivered speeches. Nearly 200 guests were present including representatives from the Chinese and British government, business sectors, Chinese companies in the UK and overseas Chinese. 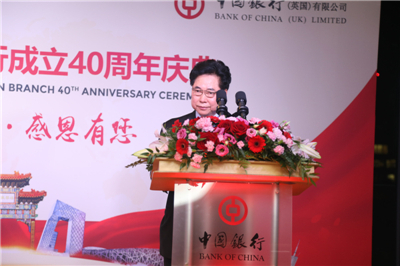 Ambassador Liu extended his warmest congratulations to the Bank of China (UK) Limited London Chinatown Branch on its 40th anniversary and commended the Bank of China on its achievements through intensive cultivation in the British market and assiduous service to the local community while launching its branches all over the world over the past 40 years. 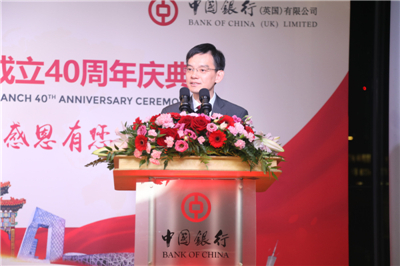 He expressed the hope that the London Branch and the Chinatown Branch would continue to be the leader in the internationalization of China's banking institutions, a promoter of China-UK financial cooperation, and a contributor to the economic and social progress of the local community. They would become the "central force" driving China-UK financial cooperation and the "central pillar" supporting regional development and sub national exchanges between the two countries to make greater contribution to the steady and sustained development of the China-UK "Golden Era". 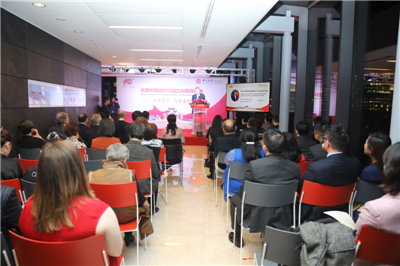 Mr. Fang said that, with the joint efforts and strong support of all parties, the London Chinatown Branch actively serves the local community and fulfils its social responsibility. In the future, it will continue to provide better services to the Chinese companies in the UK and local customers to help deepen China-UK economic and trade exchanges. 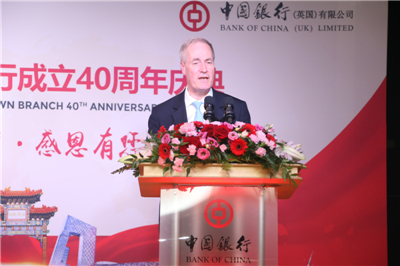 Lord Bates spoke highly of the important role the London Branch has played in promoting China-UK financial cooperation. 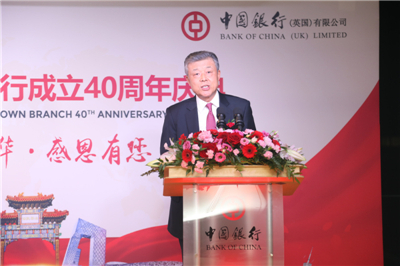 Hailing China's great achievements over the past 40 years since reform and opening up, he hoped that the Bank of China would continue to grow and contribute more to China-UK economic and trade cooperation. 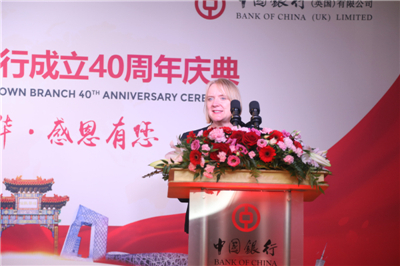 Ms. McCartney said that the Bank of China has flourished in London for 40 years, actively serving the local community and contributing to London's diversity and development. She expressed her best wishes that the Bank of London would have a broader prospect in London. Mr. Tang said that the London Chinatown Branch has provided quality service to the overseas Chinese in the UK, and in particular, its huge support to many small-scale Chinese companies, and won unanimous praise. He is convinced that the Bank of China will continue to develop and make more progress in the future. Established in 1929, the Bank of China London Branch was modern China's first overseas banking branch. The West End Office was established in London Chinatown in August 1928 and upgraded to the West End Branch in 1992. In October 2007, its name was officially changed to London Chinatown Branch.